The Class 323 is one of my favourite trains to ride on in Birmingham. Here we will look at this Electrical Multiple Unit from Lichfield Trent Valley, via Birmingham New Street, down to Redditch. And now a newly opened extension to Bromsgrove! The Cross City South includes the line down beyond Longbridge. Cross City North beyond Sutton Coldfield. Staffordshire to Worcestershire. The Cross City Line opened in 1978. It was extended to Redditch in 1980 and to Lichfield Trent Valley in 1988. The service was extended to Bromsgrove by 2018. The route was electrified in the 1990s, being completed by 1993. The Class 323 Electric Multiple Units first introduced on the service around 1994. After the creation of the Franchising system, Central Trains ran the Cross City line from 1997 to 2007, then London Midland from 2007 to 2017. And now West Midlands Railway from late 2017 to present. One of my first rides on the Cross City Line was to Lichfield Trent Valley during early January 2012. The redevelopment of Birmingham New Street Station was in it's earliest years, and I got a train up from Kings Norton. London Midland 323214 was my ride to Lichfield that day. The current northern end of the line / terminus, on the High Level. The Low Level is on the West Coast Main Line, between London Euston and Crewe (back then London Midland, now London Northwestern Railway). You would see non-stopping Virgin Trains services passing there! In Staffordshire. I have visited Lichfield City Station twice. The first time in January 2012 coming back from my day out in Lichfield. The second time for a return visit during April 2016. The only Class 323 exterior I took there was in 2012. London Midland 323207 was my train back to Kings Norton. We will next skip a few stations until Four Oaks (I have not got off at the stations in between). A visit to Four Oaks in Sutton Coldfield during October 2018. By then many of the Class 323 trains under West Midlands Railway were in a orange and white livery. I caught this train West Midlands Railway 323 204 from Birmingham New Street. Mere Green was in walking distance of the station with a new shopping centre. This was platform 3 where the service terminated, it would have waited a while before heading back to Birmingham. My first visit to Sutton Coldfield by train was during January 2017. Seen arriving at the station was London Midland 323211 on it's way to Lichfield Trent Valley (the destination display doesn't come out too well in photos). I got the train to Sutton Coldfield again during August 2017 while on the Big Sleuth hunt (I didn't go up for the Big Hoot in 2015, as I hadn't visited Sutton Coldfield with my camera at that time). It's also now possible to get the X4 or X5 buses up to Sutton Coldfield instead (much longer journey though). You can see planes coming into land at Birmingham Airport from here. While I've seen Wylde Green Station, I've not waited to catch a train from there. I almost went down there on my second rail visit to Sutton Coldfield, but ended up getting a bus back to Sutton Coldfield Town Centre, after finding some more Big Sleuth bears in August 2017. Chester Road in Erdington next. My first visit to Erdington by train was during May 2014, mainly to check out the Josiah Mason bust for the first time. So I got the Cross City line up to Chester Road. My more recent second visit was in December 2018. I had got the 11A Outer Circle bus to Erdington, then walked up the High Street, then up Orphanage Road towards the Josiah Mason bust (to see it for a second time). After that I walked up Chester Road to the station. I caught West Midlands Railway 323221 back to Birmingham New Street. My May 2014 visit to Erdington that started at Chester Road ended up at Erdington Station. Seen here was London Midland 323207 on it's way to Lichfield Trent Valley. This station is a good place to see planes taking off from Birmingham Airport! Something else other than trains while waiting for my train back to Birmingham New Street. Headed to Gravelly Hill during April 2015, to walk under Spaghetti Junction. My train back to Birmingham New Street had London Midland 323212 at the front (seen below in the photo) and 323243 (which I got on). It's always nice to ride on the train between Gravelly Hill and Aston, below the concrete lanes of Spaghetti Junction, more unique than going in a car! Salford Junction is also nearby, a junction of several canals. I've been to Aston Station several times over the years. First got off there in 2012. I've also been there in 2016 and 2017. The line to Walsall on the Chase Line diverts to the left, while the line to Sutton Coldfield and Lichfield goes to the right. On New Years Day 2016, I got London Midland 323208 from Birmingham New Street to Aston. This train was going to Lichfield Trent Valley. My first visit to the Birmingham Museums Collections Centre included a stop off at Duddeston on London Midland 323218, which I caught from Kings Norton, in May 2012. Back then I wasn't comfortable with starting at Birmingham New Street, and I used to get the 11C bus to Kings Norton (it was also before I figured out you could buy a ticket on the Snow Hill lines to a destination on another line). Dollman Street is just round the corner from here. Before I left the station, I checked out the face art sculptures on the platform. Cross City North is done above, now for Birmingham New Street, before we explore Cross City South! Many trips on the Cross City line normally start for me from Birmingham New Street, so I don't always take photos of the Class 323 there! I've been taking photos of these trains there since about 2010. I've watched the station transform from 2010 to 2015, and have continued to use it since it's been completed! I first saw a Class 323 in West Midlands Railway orange and white at Bournville, where I caught this train. West Midlands Railway 323204 seen at Birmingham New Street during August 2018. It stopped at platform 8a. Not a brilliant photo, but a London Midland Class 323 seen at Five Ways station during January 2015 from Bath Row. It is also possible to see the station from Islington Row Middleway, or from the steps down the Worcester & Birmingham Canal. I did once try out using this staiton during April 2015. But didn't get any photos of any Class 323's while I was there. I did get a Class 170, but the only Class 323 I took was going into the tunnel and I had just missed it! Went to University Station during July 2017 while on the Big Sleuth hunt. Was several bears to be found around the University of Birmingham. Seen at the station was London Midland 323208. I travelled from Birmingham International via Birmingham New Street to University that day! Was also bears at Resorts World. I previously tried to use the station in March 2012 to go to Tamworth, but ended up catching another Cross City train to New Street, and catching a Cross Country train from New Street to Tamworth (back then). Cross Country do stop at University though! The West Midlands railway franchise transferred over from London Midland to West Midlands Railway during December 2017. Here was West Midlands Railway 323204 at a snowy Selly Oak. The first time I've used the station. I mostly get the bus to and from Selly Oak! 323221 was at the other end. Loads of delays that day, probably due to the snow! Some trains were cancelled due to the weather. Not really the best day to try out Selly Oak Station! This station is next to the Worcester & Birmingham Canal and is your stop for Cadbury World. Seen in October 2011 was London Midland 323215. This was before I started using the Cross City Line (from 2012 onwards). This ramp leads from the Mary Vale Road bridge, and goes down to the towpath of the canal, as well as to the station. I later actually used the station in 2014, 2015, 2017 and 2018. Before I was comfortable with getting trains from Birmingham New Street, I used to get them from Kings Norton. Seen arriving here was London Midland 323212 during April 2012. Which I got to Longbridge. Platform 4, as platforms 2 and 3 are abandoned. Platform 1 is for trains to Birmingham and Sutton Coldfield. Other fast trains pass through here too! I have used Northfield Station a few times in my travels, but not really taken a photo of a Class 323 from the platform. This one of a West Midlands Railway Class 323 in orange and white was seen from another train during November 2018. An ideal station to get to, to explore the new Longbridge Town Centre. I've been to this station many times. Seen opposite was London Midland 323212 during April 2012, which I'd earlier got down to Longbridge. Before the extension to Bromsgrove this was a terminus for most trains, with at least one an hour going to Redditch. The station building here is now being redeveloped. It's the last station in Birmingham on the line to the south. The last four below are all in Worcestershire. At Barnt Green the lines splits. One to Redditch, the other to Bromsgrove and Worcester. On the Cross City line, the trains stop at Barnt Green for Redditch, as it curves to the left. I got London Midland 323217 from Birmingham New Street. I got off here, but the train was going to Redditch. On my second visit during April 2017 I went to the Lickey Hills Country Park. A long hard walk up the hill (I walked back to the station via the roads nearby). I first got a train to Redditch during January 2013. I arrived on London Midland 323210. A single platform station it is the current end of the line. There is an old railway tunnel nearby with street art. My second visit in November 2017 was before the end of the London Midland franchise. I've been to Bromsgrove 3 times. First in 2013 to the old station, second in 2016 to the new station. In November 2018 I returned again after electrification to Bromsgrove was complete and the Cross City line extended services from Longbridge. Seen here was West Midlands Railway 323216. In orange and white, my ride back to Birmingham New Street. It did not stop at Barnt Green. Follow me on Twitter here ellrbrown (over 1000 followers!). A last update for March featuring more nice crane photos like this of one reflected in the Hyatt Regency Hotel and the removal of the cranes at Bank Birmingam and Exchange Square. 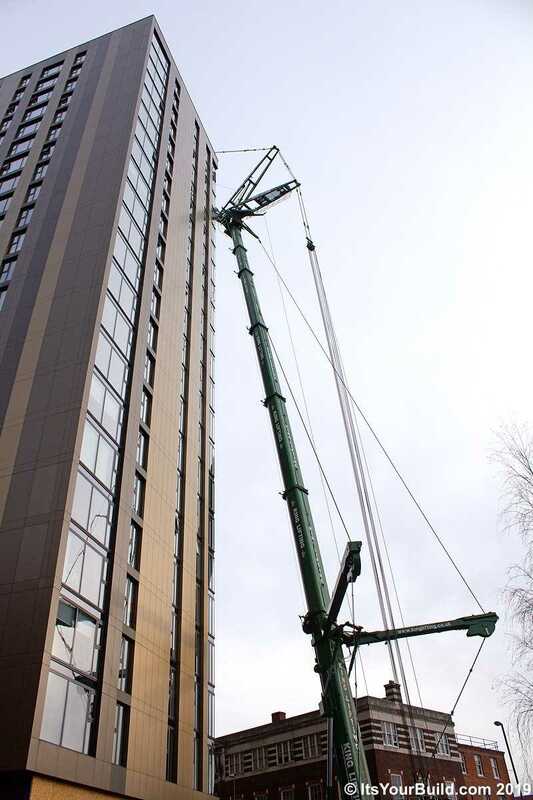 Six more photos from the crane removal at Bank Tower Two using King Lifting's massive mobile unit. 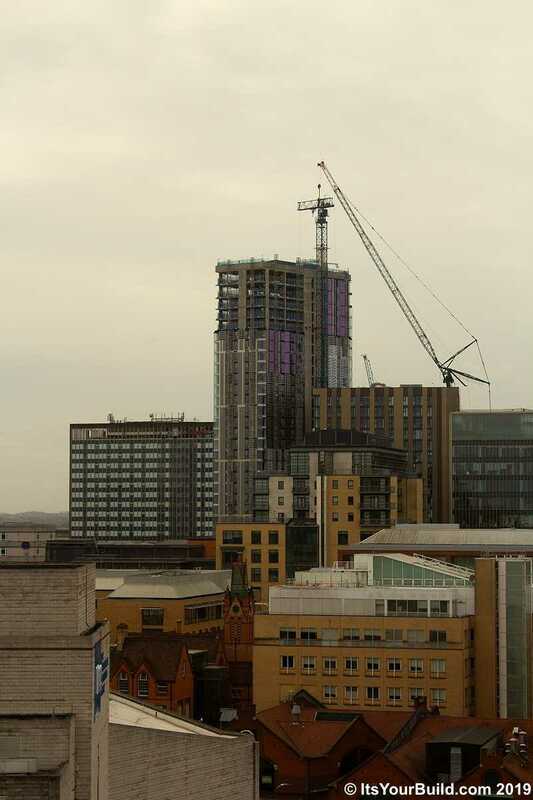 The focus of construction at Bank Birmingham is now on the cladding of Tower Two as the crane is now removed, lots more is revealed and the windows on one corner are installed to the top. 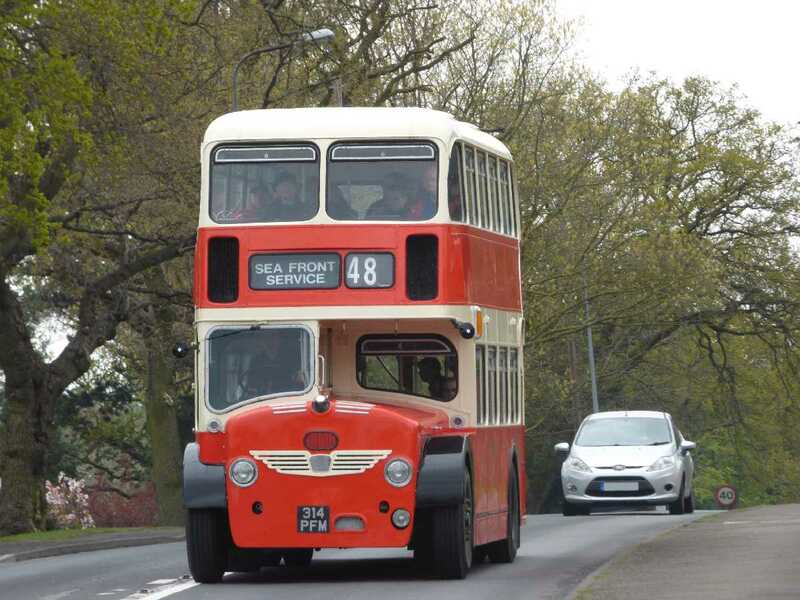 On Bank Holiday weekends, up and down the Alcester Road, between the Wythall Transport Museum and Birmingham, you may see the odd vintage bus going up and down, taking passengers on rides from the museum to various nearby locations. From Hollywood, south of the Maypole, then up Kings Heath, towards Bristol Street and last stop at The Alexandra Theatre on Suffolk Street Queensway! You may be suprised that there is an area near Birmingham, called Hollywood! Just south of the Maypole, down the Alcester Road South towards Wythall is Worcestershire's very own Hollywood! On the Easter Monday Bank Holiday in 2017 I had a walk from The Maypole towards Whitlocks End Station, when I spotted three heritage buses on special journeys from the Wythall Transport Museum! You can find out when the next event is on at this link Event Days. Metrobus on the 48 - 2462 - NOA 462X - returning to Wythall from the Maypole. Easter Monday 2017. Sea Front Service on the 48 - Southern Vectis - 314 PFM - Carters - returning to Wythall from the Maypole. Easter Monday 2017. Carisbrooke Castle on the 48 - 570 - Bristol Lodekka - Southern Vectis - YDL 315 - returning to Wythall from the Maypole. Easter Monday 2017. The 48 - 322 - Midland General FRB 211 H Bristol Rear-Engined Double-Decker Bus - FRB 211H - seen here heading to the Maypole. Late May Bank Holiday Weekend 2017. Not wanting to walk back to Whitlocks End again, I turned back to the Maypole (hoping to see another bus). The 750 to Birmingham I did see but missed getting a shot of it (see the photo at the end of this post from Suffolk Street Queensway). Yardley Wood Bus Garage celebrated it's 80th birthday during November 2018, and they had bus rides around the local area. On other Bank Holidays I did try and go to Kings Heath, to see if I could spot one of the vintage buses but I kept missing them, or didn't have my camera ready. These photos below were taken from the top deck of the no 50 bus I was on to town. These buses are not part of the Wythall collection. I have previously been on rides on this pair of vintage buses! Previously rode on this bus during the pair of open days at Acocks Green and Yardley Wood bus garages in early October 2013, on the occasion of the bus garages 75th birthday. 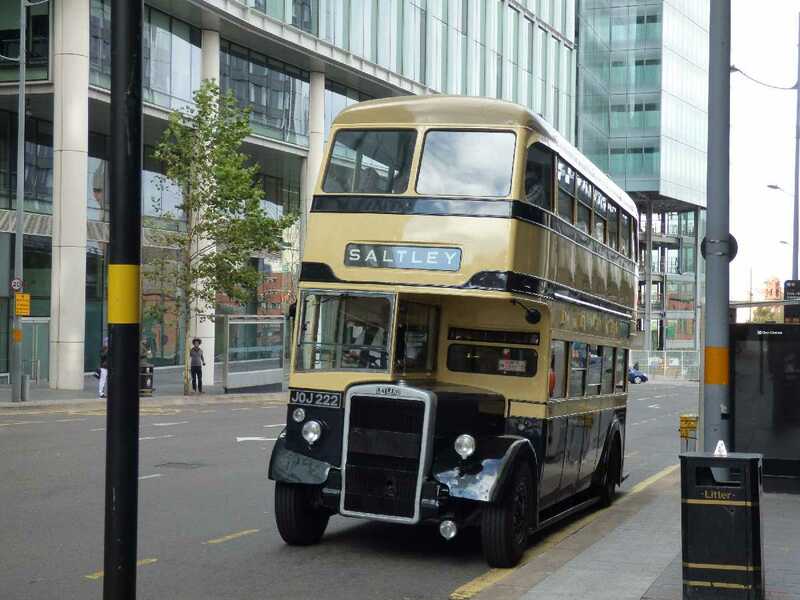 Saw this bus again only 2 months after I had ridden on it from Snow Hill Queensway to the Birmingham Museums Collection Centre! If seeing the vintage Wythall buses on Bank Holiday's was hit and miss in the Maypole, Kings Heath or Moseley, the next option was to check them out in the city centre! I checked their timetables, so I had a fair idea approximately where they would be. 750 to Birmingham - GREEN LINE AEC RCL CUV 219C - CUV 219C - London Transport - AEC Routemaster - seen on the Easter Monday 2018 Bank Holiday. I had walked up to the Alexandra Theatre, but didn't see the expected bus, then walked down Bristol Street, before this one went past me! Route 750 to Birmingham (Alexandra Theatre) - 1256 - FRC 956 - Trent FRC 956 Leyland PD2/12 with Leyland body - seen the late May Bank Holiday Monday 2017. I had previously tried to see this bus the day before in Kings Heath but I missed getting a decent shot of it (or I saw it being towed back to Wythall). So seeing it arriving at the Alexandra Theatre was my best chance of seeing it! At this point heading onto Suffolk Street Queensway from Holloway Circus and Bristol Street. 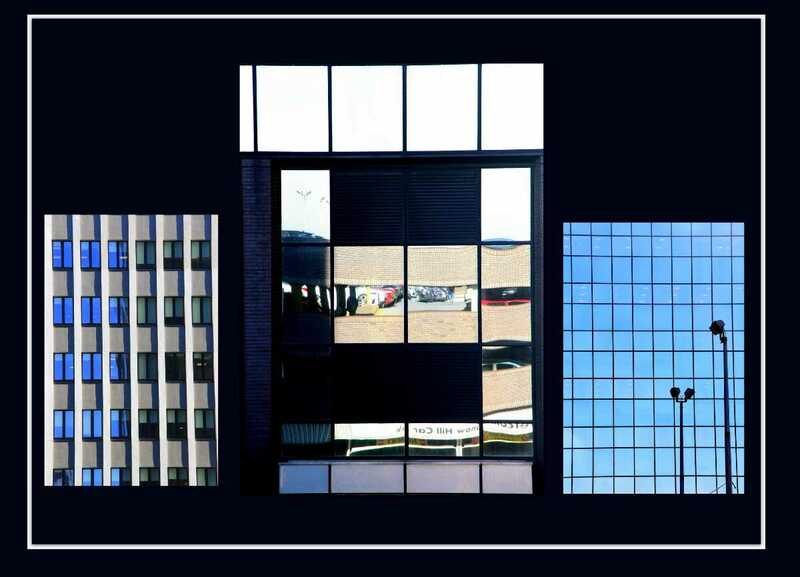 Here we have selected 10 of the best photographs from the talented Peter Leadbetter, a photographer and one of Birmingham's 'People with Passion' at BirminghamWeAre. Open the full post to view Peter's wonderful photography taken in and around Birmingham. A look back to my vintage bus ride in September 2018 when an open day was again held at the Birmingham Museums Collections Centre on Dollman Street. Was a long wait on Snow Hill Queensway before the bus came! But was well worth the wait. 2222 aka JOJ 222. A long wait on the 16th September 2018 during Heritage Open Week in Birmingham. After a visit to Highbury Hall, next on the agenda was a return visit to the Birmingham Museums Collection Centre, on Dollman Street. I heard about the free vintage bus ride, so I wanted to go. A 50 minute wait at bus stop SQ3 outside of Lloyd House, but it was worth it! Seen arriving on Snow Hill Queensway was former Birmingham City Transport bus 222. JOJ 222. Made by Leyland. To "Saltley". Passing Three Snowhill. It was approaching bus stop SQ3. Worth the wind and rain to see it and ride it! Birmingham City Transport with Birmingham's Forward coat of arms. Top deck. The seats are a bit different to modern buses and the ceiling is much lower! I sat on the left. The steps are at the back of the bus, not near the front. Similar to old London buses! 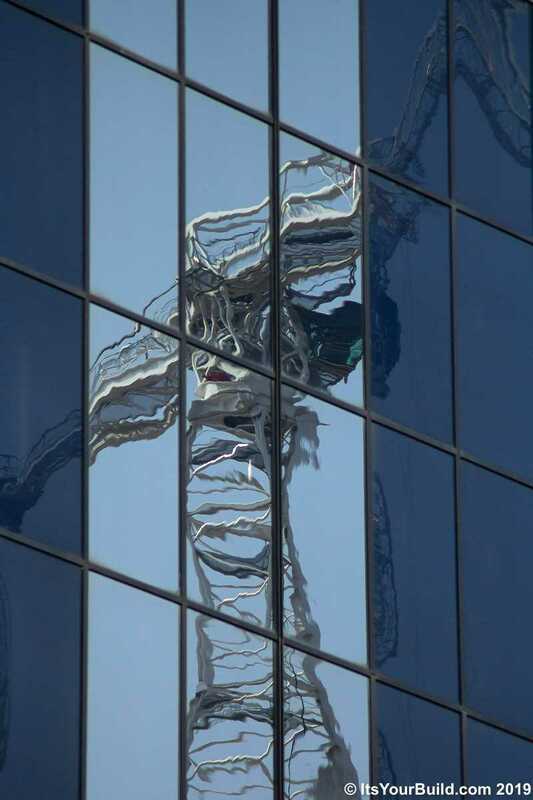 Reflection in Lloyd House, the West Midlands Police Headquarters. I believe this section is now a little exhibition with the history of the West Midlands Police. "Spitting strictly prohibited offenders will be prosecuted". One of the signs I saw on the top deck! What was their litter policy back in the day? "Any passenger leaving this omnibus without paying the fare and with intent to avoid payment is liable to prosecution". To be fare / fair, it was a free bus ride, so no ticket, and I don't think my Swift Card would have been accepted! If you wanted to stop the bus to get off, press this button. I would think that the light would come on? Close up look at the button. The metal has rusted a bit. You have modern equivalents of these on modern buses! 2222 the buses ID. Modern buses have ID numbers like this too. After leaving Snow Hill Queensway, the bus went via Colmore Circus Queensway, Steelhouse Lane, Corporation Street (near the Aston Expressway), Dartmouth Circus, Dartmouth Middleway, then up Vauxhall Road, Great Francis Street, Duddeston Mill Road and down Dollman Street. Once the bus had parked near the Birmingham Museums Collections Centre, it was time to get off. On the way down the steps I saw theses signs. "Beware of approaching vehicles when leaving or passing behind this vehicle. Safety First". Bus destinations used to be on rollable blinds like the one below (modern buses have digital ones). It was still like this until at least the 1990s! Bottom sign says "Passengers are requested not to alight except at authorised stopping places". These buses didn't have automatic doors, in fact they had no door at the back, but only a conductor to collect tickets! View of the other side of JOJ 222 / 2222 from after I got off the bus, and before I went into the Birmingham Museums Collections Centre for my second time in over 6 years! Many more exterior columns have been installed, lots of great photos of the building from around the area in this gallery. 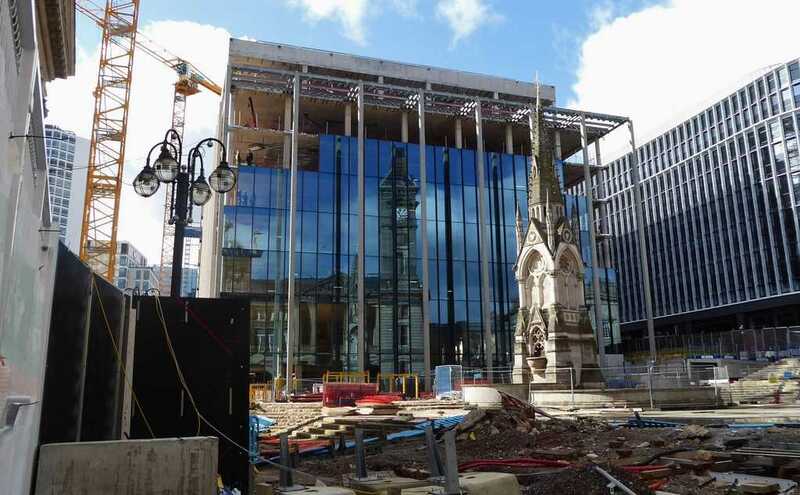 Here's a few nice shots of One Chamberlain Square from some interesting viewpoints. 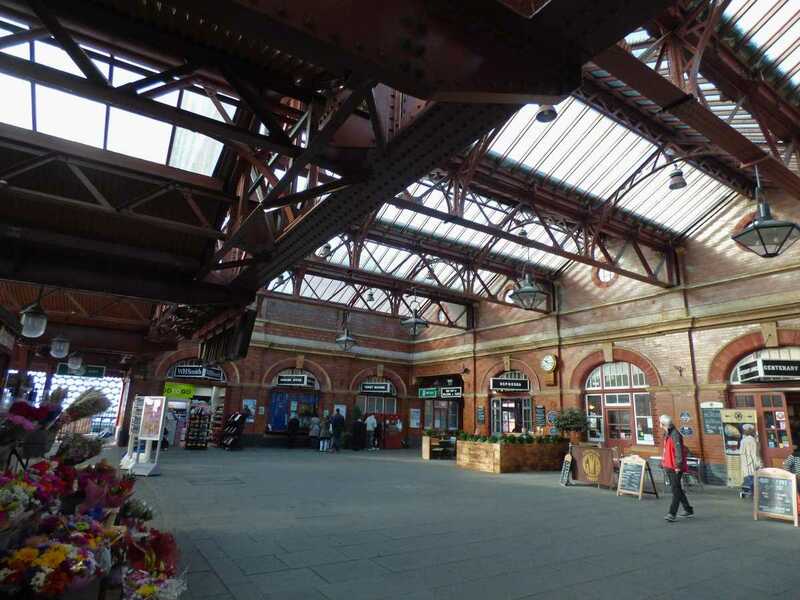 Plans in place to develop this magnificent Grade II station and 'future proof' the City's ability to cater for significant growth in visitor and commuter numbers. All this whilst protecting the station's entrance and concourse which are both of huge historic value to Birmingham. Photo by Elliott Brown, a People with Passion from Birmingham. 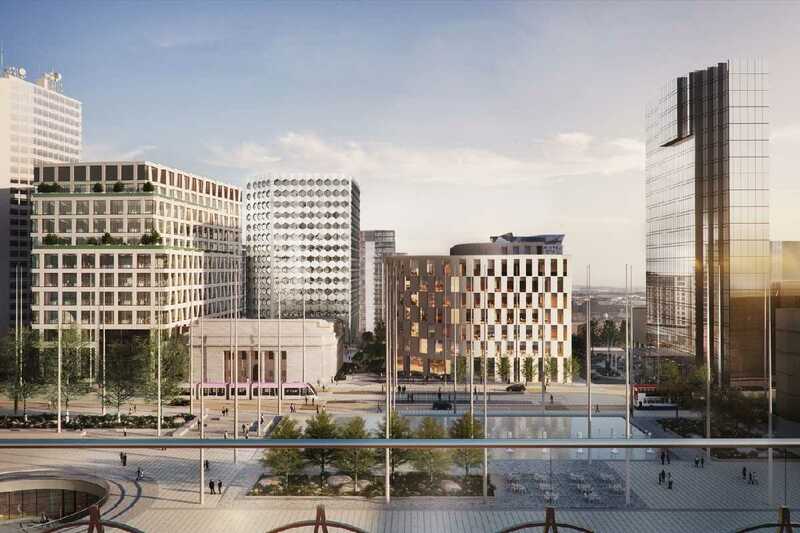 The plans to redevelop Birmingham’s historic Moor Street station, creating links to Birmingham New Street and planned HS2 services into and out of Curzon Street have now been revealed. Here are some artists impressions produced by Grimshaw Architects. As we can see on the artists impressions from Grimshaw Architects, it is fantastic to see that attention and due consideration is being paid to retain the station’s Grade II listed entrance and concourse dating back to 1914. A selection of photos of the trains that usually stop (or used to stop) at Birmingham Moor Street Station. Chiltern Railways operates the station and it has been restored to an Edwardian style in the mid 2000s. Central Trains, then London Midland and now West Midlands Railway also had / have services that stop here from Warwickshire and Worcestershire! Seen at platform 4 at Birmingham Moor Street Station, during November 2011 was Chiltern Railways 168108. 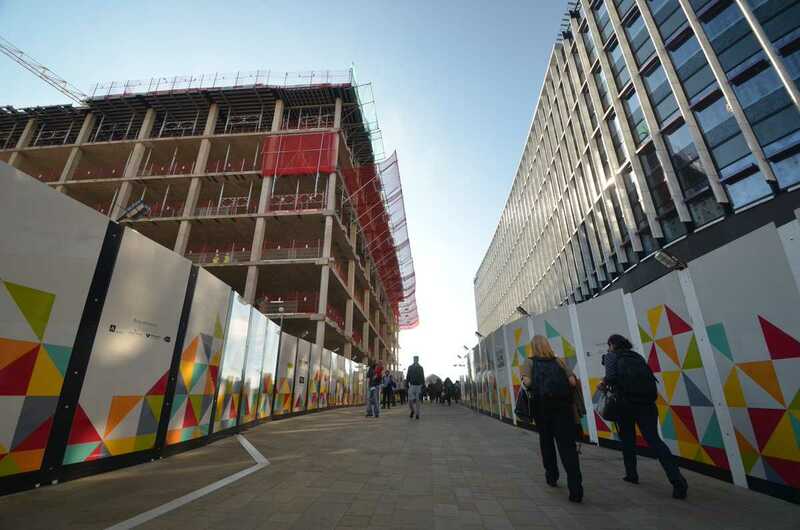 With Selfridges and the Rotunda to the left, and the Pavilions straight ahead (that would close in 2016 and Primark will open there from April 2019). Platform 3 and 4 were reconnected in late 2010 for services to London Marylebone and Leamington Spa. London Midland 172 342 was at platform 2, a train I had just got off at during November 2011. The Class 172's were introduced by London Midland to replace the old Class 150's (which later went to other rail franchises around the country). Heading up platform 3 towards the ticket gates in the concourse. Chiltern Railways 168214 was on the left. You usually see timetable artwork from local schools on the buildings around the station. A foggy day during November 2012. This train was going to Leamington Spa. It was August 2013 when I saw Chiltern Railways 165019 and 67017 at platform 3 an 4 respectfully. This time round, the Class 165 was going to Leamington Spa. while the Class 67 with the Silver Service on the Mainline to London Marylebone. Chiltern inherited them from the short lived Wrexham & Shropshire who used to have trains from Wrexham to Marylebone. These were later replaced by the Class 68's. You would regulary see a pair of Chiltern Railways trains at platform 3 and 4. Usually a Class 168 and / or a Class 165. Seen here during February 2014 was Chiltern Railways 168003 and 165019. The train on the left was probably bound for London Marylebone, while the one on the right for Leamington Spa. Early January 2016 and my first sighting of a Class 68 at Moor Street Station. Chiltern Railways 68009 Titan leading the Silver Service on the Chiltern Mainline down to London Marylebone. These look cooler than the old Class 67's (which they no longer use). This one was owned by Direct Rail Services. Was at platform 3. The Oxford Flyer which was Chiltern Railways 68010 seen in January 2017. Named as such after Chiltern introduced a new service from London Marylebone to Oxford (you can't get a direct train from Moor Street to Oxford without changing at Banbury, or perhaps Bicester North). Another Direct Rail Services Class 68. This one Chiltern Railways 68008 Avenger at platform 4 during January 2017. This reminds me a bit of (spoiler alert) the scene in Captain Marvel when Nick Fury names the Avengers! A view from Moor Street Car Park, as a West Midlands Railway Class 172 train is seen departing Moor Street Station over the Bordesley Viaduct in Digbeth. Seen March 2018. It was either on the line to Dorridge, or the line to Stratford-upon-Avon via Whitlocks End. It was the Sunday that the previous St Patrick's Day Parade was held. Despite the restoration of platform's 3 and 4, Chiltern Railways still uses Birmingham Snow Hill Station (and have occasional services to / from Kidderminster and back to / from London Marylebone during rush hour). Chiltern Railways 168003 seen during March 2018 stops at platform 2, before heading through the Snow Hill Tunnel for it's final stop at Snow Hill Station (usually at platform 2). Selfridges and the Rotunda in view from where I was at platform 1. While Primark would have another year of construction to go. March 2018 again and a pair of West Midlands Railway trains still in the old London Midland green. 170633 waiting to head through the Snow Hill Tunnel, towards Worcester and 172 345 waiting to depart for Dorridge. Primark development behind, had 11 months to go! West Midlands Railway took over from London Midland in December 2017. 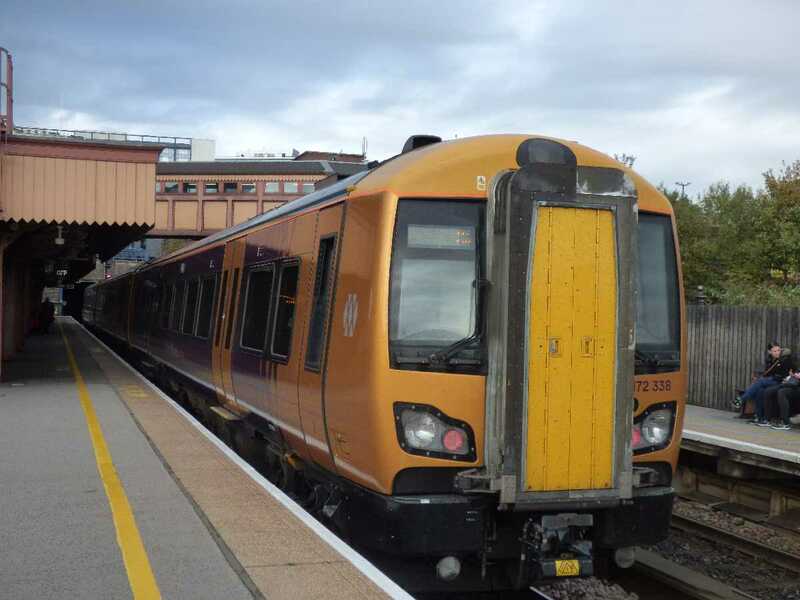 The Class 172/3's have in 2018 / 2019 been recoloured orange and purple. Seen at platform 2 during October 2018 was West Midlands Railway 172 338. I had just got off this train from the Shakespeare Line. 3 trains an hour Monday to Saturday, 1 train an hour on Sunday (the same I think for both the Shakespeare line and Dorridge line, although I could be wrong). West Midlands Railway 172 332 seen in the new orange and purple livery seen at platform 2 during November 2018. Inside (for now) they are still green, but hopefully West Midlands Railway will change the maquettes on the seats soon! There has been some of the hexagon window and cladding frames installed on the Bridge Street side of the building, not long now till the exterior of the building will show how it will sit with the others around it. Moseley Bog is not that far away from me, just catch the 11C up the Swanshurst Lane and get off the bus on the Yardley Wood Road near Swanshurst Park. The main entrance to Moseley Bog is on Yardley Wood Road. This photo gallery ahead of a proposed Birmingham We Are group visit to the bog! Part of the Shire Country Park. Another entrance / exit is on Pensby Close. A gallery of 20 photos. The first 13 from my visit in December 2012. The last 7 from my visit in September 2016. It is easy to get lost in here! Best to start from the main entrance on the Yardley Wood Road in Moseley. The bus routes here are the 11A / 11C (bus stops on Yardley Wood Road near Swanshurst Park). Or the 2 or the 3 from the city centre or Yardley Wood. You could also get the 5 to Wake Green Road, close to where JRR Tolkien used to live as a child, when Sarehole was a hamlet. You could also get the train to Hall Green Station and then walk down Cole Bank Road past Sarehole Mill (or catch the 11C down the hill if you want to). Trains from Birmingham Snow Hill / Moor Street or Shirley down to Stratford-upon-Avon. 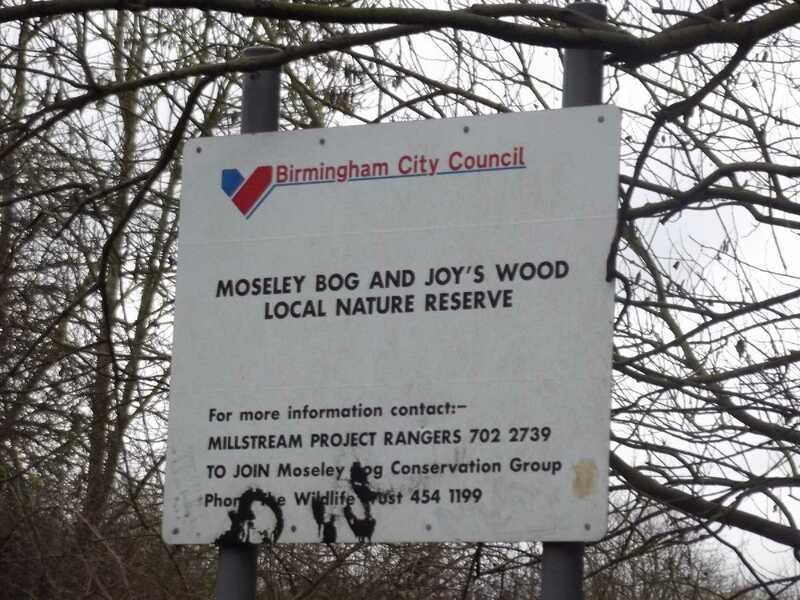 Birmingham City Council sign for Moseley Bog and Joy's Wood Local Nature Reserve seen on Yardley Wood Road. The sculpted entrance gate to Moseley Bog from the Yardley Wood Road entrance. Small car park here. Welcome to Moseley Bog - this sign was near the Yardley Wood Road entrance, with a map of the area. Decking all around now, so your shoes are less likely to get muddy, but it could still be wet if it's rained! More decking to walk around. Around to the right past the trees. Which way, left or right, it's up to you! Narrow planks if you go this way. A sign to stop and read close to this corner decking stop point. There is steps here to go down to the dirt track. Take these steps to the exit onto Pensby Close. A cul-de-sac. Head out via that road then onto Thirlmere Drive, then you get to Wake Green Road near Sarehole Mill. Not all the routes are decked out. Are some dirt paths to follow as well. The next 7 photos from a return visit in September 2016. Somehow didn't get photos of the bog itself until 2016! Different conditions in different seasons. Can see other members of Birmingham We Are enjoy taking photos of this from different angles! Someone had made a camp site in Moseley Bog. Perhaps Cubs or Scout groups or school parties use the bog? Several fallen trees. Was looking a bit muddy underneath. Another fallen tree, this one above a pool of water. A muddy stream with logs in it. Those steps again that I used in 2012. In 2016 I entered via Pensby Close, and had hoped to find my way to the Yardley Wood Road entrance / exit. But it is easy to get lost, and ended up going back to the Pensby Close entrance / exit again instead! Would GPS / a compass help me / us find a route out? 20 Mar 2019 - Elliott Brown Did you know? Did you know that the first object donated to the collection of the Birmingham Museum & Art Gallery was a marble bust of the landscape artist David Cox (1783-1859). It was made in the early 1860s by Peter Hollins. Cox used to lived in Harborne from 1841 to his death in 1859. He is buried at Saint Peter's Church in Harborne where a window is dedicated to him in his honour. The bust of David Cox and a small exhibition about him used to be at the Birmingham Museum & Art Gallery, on the landing area of the museum, not far from the doors to the stairs that leads to the Great Charles Street Queensway entrance (and to the Staffordshire Hoard and other galleries). These photos below taken during March 2012. David Cox was born in 1783 and died in 1859 in Birmingham. He was an English landscape artist. He painted in watercolour. Cox was born on the 29th April 1783 on Heath Mill Lane in Deritend. He was based in London from 1804 to 1814, then Hereford from 1814 to 1827, and London again from 1827 to 1841. He moved back to Birmingham in 1841. He moved to a house on Greenfield Road in Harborne where he lived until his death on the 7th June 1859, aged 76. The bust was commissioned after his death in 1860 by the Birmingham Society of Artists as a memorial to David Cox. It was made by Peter Hollins from 1860 to 1862. It was later the first object to be donated to the Birmingham Museum & Art Gallery. The signature of David Cox that used to be on the wall above the bust in the museum. There used to be two history boards on the wall near the bust, with the history of his life on the first board below. The second board was above David Cox and Birmingham. After 37 years living away from Birmingham, he spent his last 18 years living in Birmingham in his Harborne home. The last time I saw the marble bust of David Cox in the museum was during January 2016 on the museum link bridge (it is not there now). The sign below notes that it was Birmingham's first object. If it's no longer at BM & AG now, it might be at the Gallery of the RBSA in the Jewellery Quarter. I was looking for the blue plaque of David Cox in Harborne during April 2012. It is on a house now known as David Cox Court at 116 and 118 Greenfield Road in Harborne. A Grade II listed building known as Greenfield House when Cox lived there. The house was built in the late 18th century and was remodelled in the early 19th century. David Cox lived here from 1841 until his death in 1859. His son David Cox Jr. did a painting of the house, which you can see here on Wikimedia Commons David Cox Jr - Greenfield House, Harborne. Conquest visited here, and David Cox apparently frequently visited this property! It was built in the early 19th century in the Picturesque Gothic style. Saint Peter's Church in Harborne. The East Window here is in memory of David Cox, and he is buried here in the churchyard. The church and churchyard are around Old Church Road. A Grade II listed building dating to the 15th century. It is the Parish Church of Harborne. In 1867 Yeoville Thomason was responsible for the designs of the Nave, aisles, transepts and apsidal chapel. The West Tower dates to the 15th century, and some lower details from the 14th century. Enjoy a wonderful gallery of photography from one of Birmingham's People with Passion Barry Whitehead taken at last weekends St. Patrick's weekend festival in Birmingham. 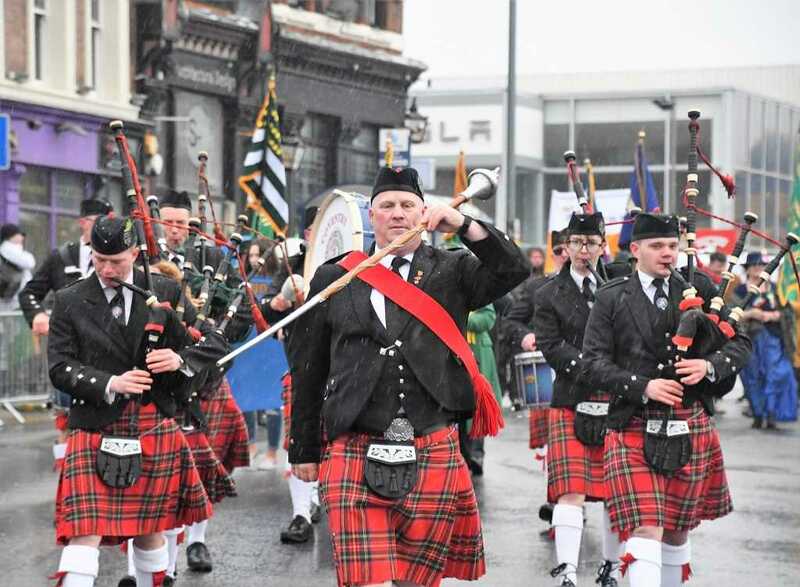 Gallery of photography from the St Patrick's parade in Birmingham - Barry Whitehead. I finally got to go to Pisa to see the Leaning Tower of Pisa during a holiday to Florence and Tuscany in June 2018. While I didn't go up the tower (not worth paying for the short amount of time to go up). Was well worth seeing it and other landmarks in the area. A comparison with the Rotunda in Birmingham, UK. The Leaning Tower was stablised by 2008, while our Rotunda was renovated. 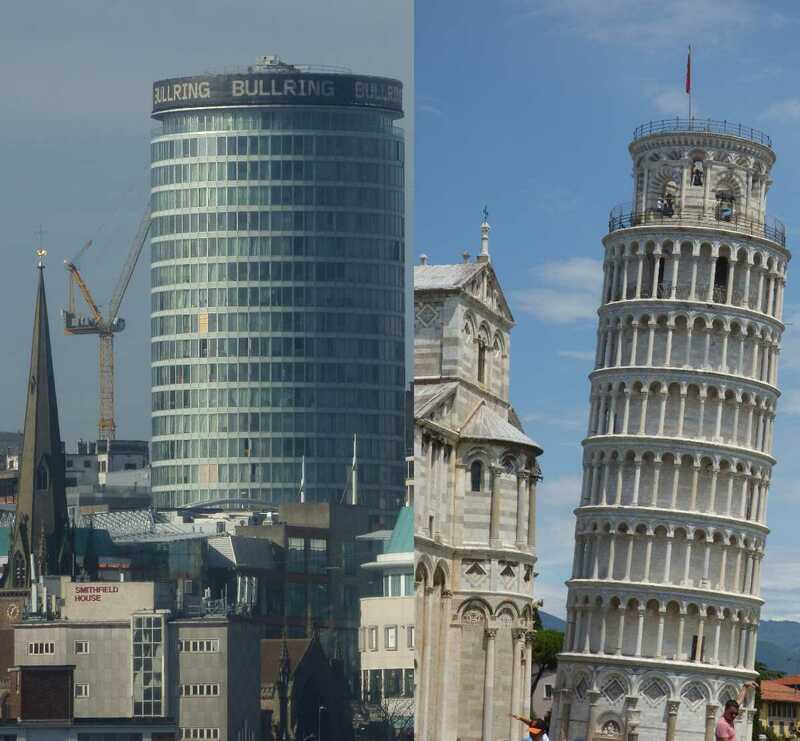 Birmingham has direct flights to Pisa, from Birmingham Airport to Pisa Airport. When I went it was with Jet2.com (organised via Riviera Travel) during June 2018. We had around 3 days in Florence, before setting off for Tuscany. On one of the touring days, after a wet morning in the city of Lucca, our coach took us to the city of Pisa in the afternoon. I remember being in Pisa, and seeing Ryanair or Jet2 planes flying over head! First up a look at the Rotunda in Birmingham, seen over many years in the city centre, from different views. 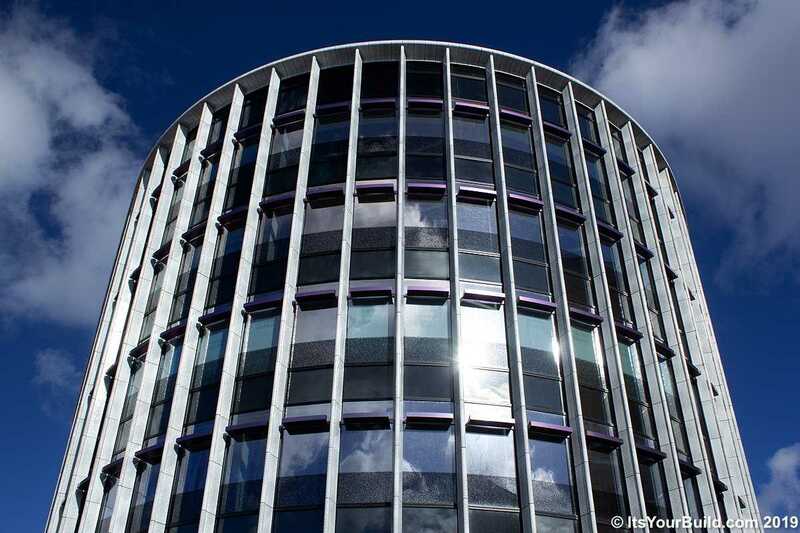 The Rotunda was built from 1961 to 1965, it was by the architect James A. Roberts, and was built with the original 1960s Bull Ring Shopping Centre. It was a 12 storey office block. It was revised to 25 storeys and had an abandoned rotating restaurant on the top floor (that was never built). In the 1980s and 1990s it was used to advertise Coca Cola (and resembled a giant can of Coke!). It was given Grade II listed building status in 2000. 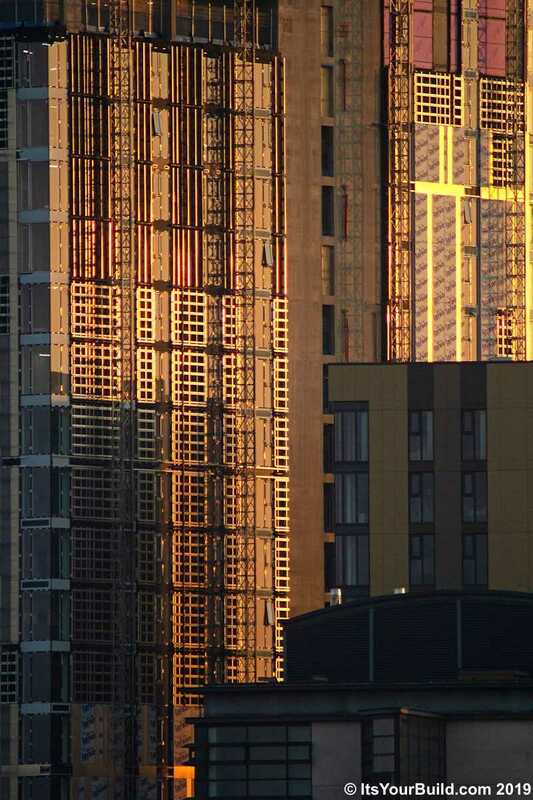 The building was rebuilt between 2005 and 2008 by the architects Glenn Howells Architects and was renovated by Urban Splash. There is now apartments and a hotel in the building. This view below was taken in August 2009 at the Bullring. Looking up from St Martin's Square on a very sunny day in Birmingham. This was around the time that I was getting photos of the Horatio Nelson statue with a blue sky. This view of the Rotunda was taken during December 2009 from St Martin's Queensway. A no 63 bus waits not far from Birmingham New Street Station (the refurbishment of the station had yet to start, but was done from 2010 to 2015). One of the "bridges" links the Rotunda side to the 2003 Bullring. 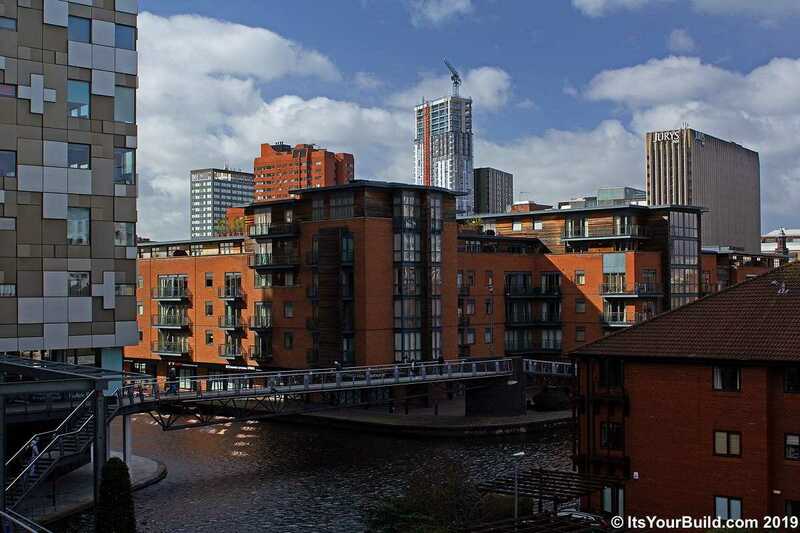 From here you can head up the ramp to Rotunda Square, or head under the dark part of St Martin's Queensway to Moor Street Queensway and Birmingham Moor Street Station. Some maps also show this as Swan Passage (probably one of the poorly designed part of the modern Bullring). 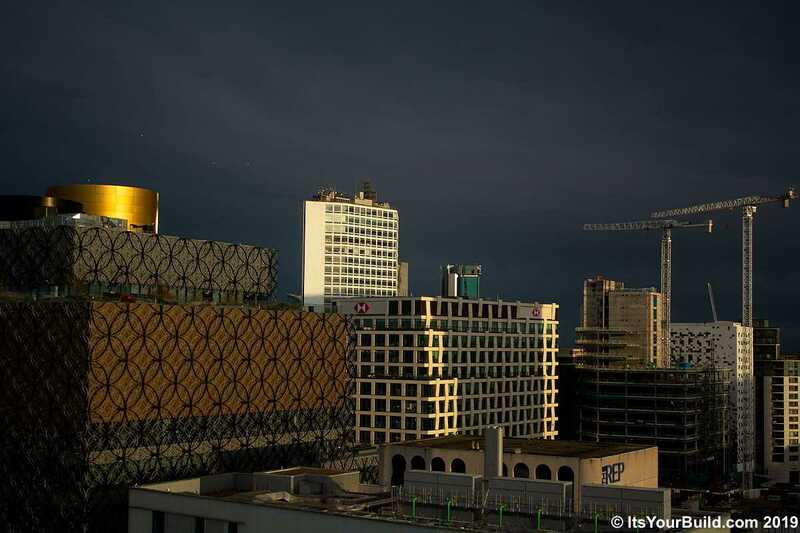 This view of the Rotunda was taken during August 2014 from Digbeth. Not far from Selfridges at the Bullring was a paint brush for the City of Colours Festival. They held a demonstation at the Bullring, and later had a day in Digbeth around the Custard Factory area painting street art on walls. Birmingham Coach Station and the BT Tower was also visible from here. Behind Digbeth Police Station is the Beorma Quarter. This was when the Adagio Aparthotel was under construction. St Martin's Church seen to the left. A view from the Library of Birmingham of the Rotunda and Ladywood House (either seen from the Discovery Terrace or the Secret Garden) during October 2015. 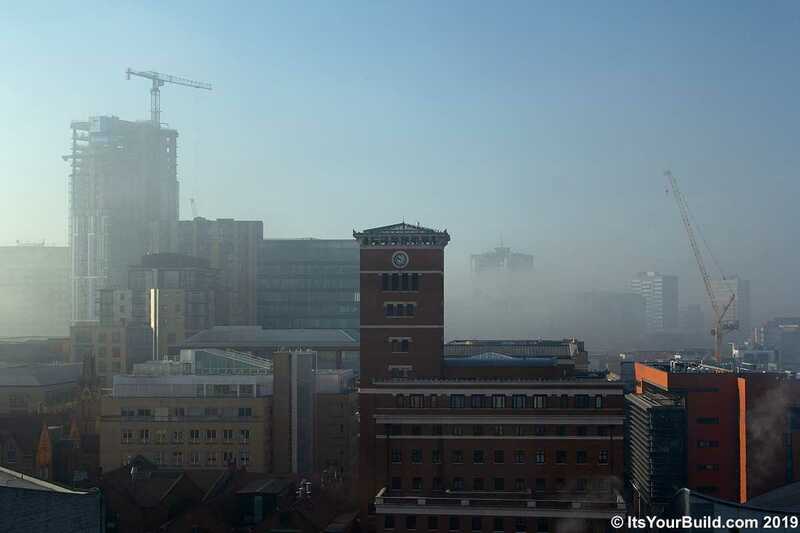 Visible from up here also was the Premier Inn hotel near Birmingham New Street Station and the Charters Building. The Rotunda seen from Bordesley Street in Digbeth, during a sunny day in January 2018. Seen with the Bordesley Viaduct (with scaffolding) and Selfridges. Moor Street Car Park is usually a good place for roof top views of the city. You can also see the Rotunda if you are standing at platforms 3 or 4 at Birmingham Moor Street Station. A Secret Garden view from the Library of Birmingham during January 2019. Seen to the left of the Rotunda was St Andrew's Stadium, the home of Birmingham City Football Club. It's also possible up there to see The Hawthorns (home of West Bromwich Albion) or Villa Park (home of Aston Villa) on a clear day. Sit at the front of the no 50 bus on the top deck for this view of the Rotunda. Seen during February 2019 on Bradford Street in Digbeth. Heading up, you can see at the Bullring: St Martin's Church, Smithfield House and Selfridges. As well as the BT Tower. In Digbeth on the right is the Adagio Aparthotel (at the Beorma Quarter development) and Digbeth Police Station. I don't fancy going up that eyesore concrete car park on Moat Lane for views, so this bus view will do for now! Another bus view, this one from the no 63 bus at the top of the Bristol Road near the Belgrave Interchange. Looking up the Bristol Road to Southside. The Rotunda seen with the McLaren Building and the tower of Exchange Square phase 1. At Belgrave Interchange you can see the on going roadworks of the Birmingham Cycle Revolution for the cycleway being built down the Bristol Road in Edgbaston. It goes as far as the University of Birmingham along sections of the Dual Carriageway. It's all change on Bristol Street too. 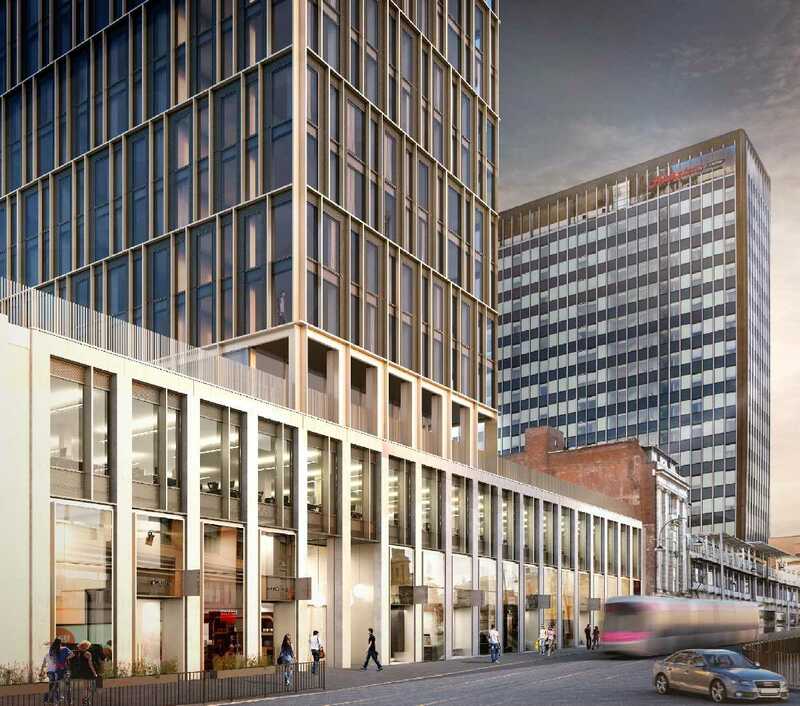 Bristol Street Motors stands alone, while the Monaco House site awaits development for New Monaco House. A church used to be down here too, but that was demolished for new housing being built on the St Luke's land (towards Sherlock Street). Now lets travel over 1000 miles to Italy. Fastest to fly from Birmingham Airport to Pisa Airport (the flight was around 3 hours with Jet2). As I said above we went to Florence first (where our first hotel was). The day after we went to Pisa. This was during late June 2018. In Italian the tower is called the Torre pendente di Pisa. It is the campanile or the freestanding bell tower of Pisa Cathedral. Work on the tower started in 1173 and was completed 200 years later in 1372. The tower began to lean during the 12th century. The tower is 55.86 metres high made of marble and stone. The tower was stabilised in the late 20th and early 21st centuries. The tower has 294 or 296 steps. The tower lean has changed since the stabilisation work was completed by 2008. It was well worth seeing, I was hoping to see it for years, before going on the Florence and Tuscany holiday. Could have paid in advance to go up, but for 30 minutes, the price wasn't worth it. So in the end, while there just explored the grounds of the Piazza dei Miracoli (Square of Miracles). This first view with the Cathedral. One of my first views after entering the tourist heavy area! Slightly more close up and zoomed into the Leaning Tower of Pisa. Tourists try to do a selfie pose of "pushing" the tower over! I tried it myself, not that the photos of me got the desired affect! Being the summer, there was loads of tourists about. It realy is leaning! This view with the lawn and the tourists at the bottom. Can you see the people on the upper level balconies? There was other monuments about such as statues and sculptures. This view of the Leaning Tower of Pisa seen with the Fontana dei putti. The monumental fountain that welcomes the entrance of the square from Via Santa Maria is by Giuseppe Vaccà (base and fountain) and by Giovanni Antonio Cybei (the marble group of putti holding the coats of arms of Pisa and the Opera). I tried to head all the way around for different views. From this side to the right of the cathedral, it looks straight! Was also a Italian Army vehicle on site to keep tourists safe. I also saw them in Florence at different sites. Even more closer looking up! I think this is near the entrance to the Leaning Tower of Pisa. Would guess that paying ticket holders would queue up around here? This view from the steps of Pisa Cathedral. We sat down here for a period. I also noticed planes flying overhead such as Ryanair and Jet2. It's really leaning from this view! It looks like here that the man on the left is leaning on the tower to push it over! While the man on the right is trying to push in left (for his own photo). Of course many tourists were trying the famous move for there holiday snaps! The tower also had a Republic of Pisa flag. That existed from the 10th to the 15th centuries. It was taken over by the Republic of Florence in 1402. Photos taken by Elliott Brown. My Twitter ellrbrown and Flickr ell brown. Construction at Arena Central is mainly Three Arena Central (HMRC Midlands) with One Centenary Square (HSBC UK) finished and Dandara externally complete. Some interesting perspectives in this photo gallery. Here is a gallery of recent photos from around the city, a selection of many more in my Full Gallery. 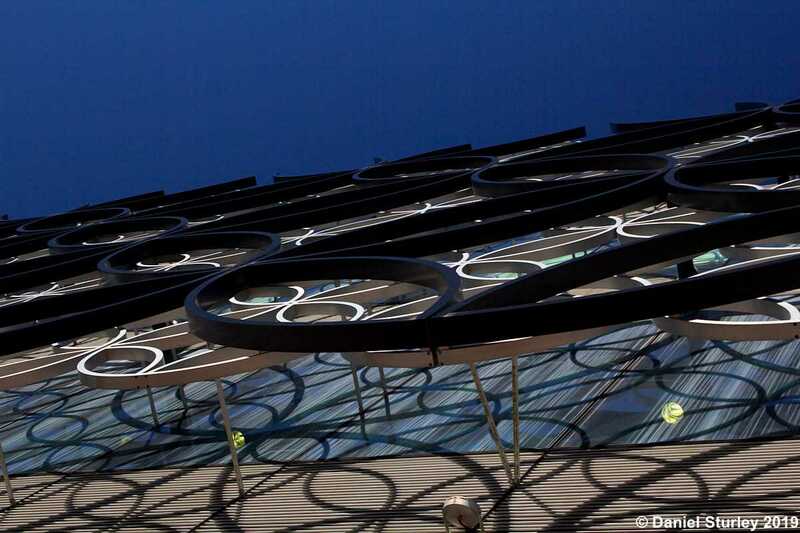 Above is looking up at the Library of Birmingham on a sunny winter's day. Leftbank Tower Two is dominating the westside and can be seen from lots of areas and angles, here from the Mailbox. 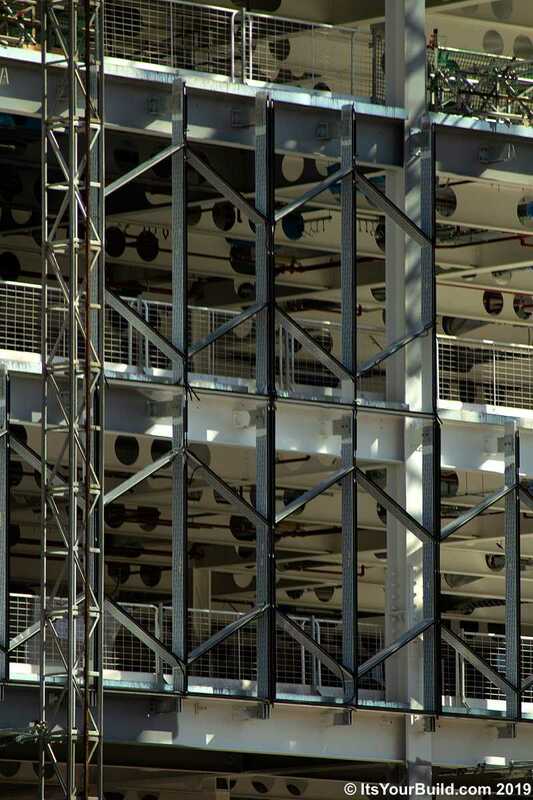 The external lifts have been extended to the top for the rest of the cladding to be installed.